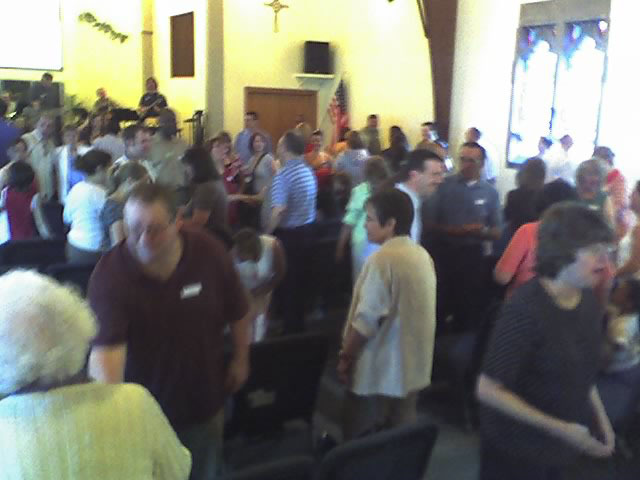 Today I had the privelege of attending the first service of the merger between Evangel Church & Ridgewood Assembly. It was a pretty amazing day and it was packed!! There was a nervous energy in the room as Pastor Mark & Jana Snavely launched into worship. Pastor Chris preached a very appropriate message on ‘Being Devoted to One Another’ out of Acts 2:42-27. The highlight of the day, though, had to be the Potluck Dinner afterwards. It was pretty cool to see the melting of two church families. Individuals from both churches talking, laughing and sharing stories. That’s evidence of a little thing called ‘the Body of Christ’!